What was the Renaissance and where did it happen? The word Renaissance is generally defined as the rebirth of classical antiquity in Italy in the fifteenth and sixteenth centuries. Seems simple enough, but the word “Renaissance” is actually fraught with complexity. Scholars argue about exactly when the Renaissance happened, where it took place, how long it lasted, or if it even happened at all. Scholars also disagree about whether the Renaissance is a “rebirth” of classical antiquity (ancient Greece and Rome) or simply a continuation of classical traditions but with different emphases. Traditional accounts of the Renaissance favor a narrative that places the birth of the Renaissance in Florence, Italy. In this narrative, Italian art and ideas migrate North from Italy (largely because of the travels of the great German artist Albrecht Dϋrer who studied, admired, and was inspired by Italy, and he carried his Italian experiences back to Germany). However, so much changed in northern Europe in the fifteenth and sixteenth centuries that the era deserves to be evaluated on its own terms. 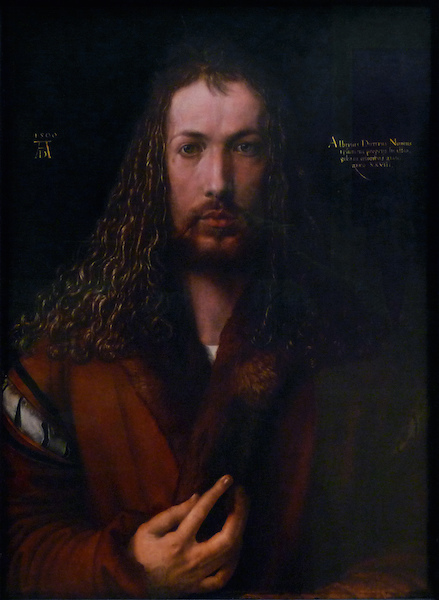 So we use the term “Northern Renaissance” to refer to the Renaissance that occurred in Europe north of the Alps. 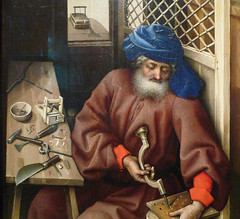 In the fifteenth century, northern artists such as Jan van Eyck introduced powerful and influential changes, such as the perfection of oil paint and almost impossible representation of minute detail, practices that clearly distinguish Northern art from Italian art as well as art from the preceding centuries. 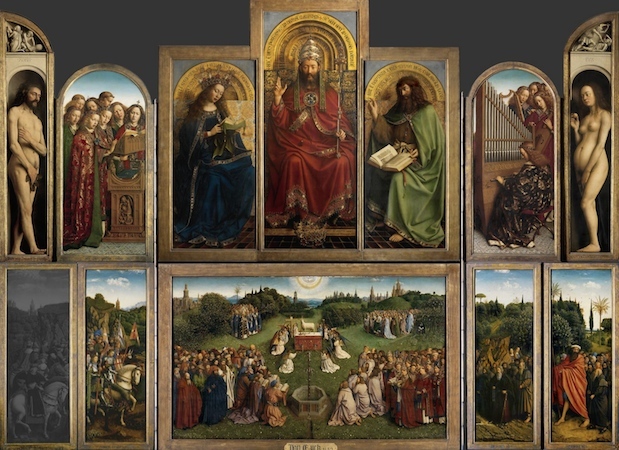 Jan and Hubert van Eyck’s Ghent Altarpiece, 1432 (Church of Saint Bavo, Ghent) exemplifies the grand scale and minute detail of Northern painting. 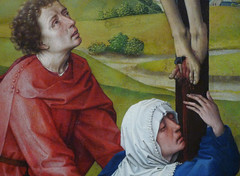 This public, religious picture has an opened and closed position. 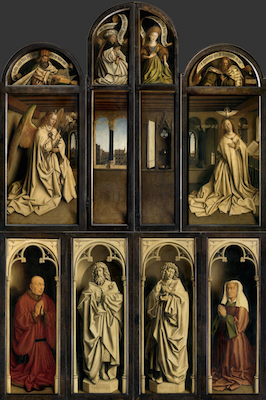 On the interior (above) we see such holy figures as the Virgin, Christ, saints and angels. 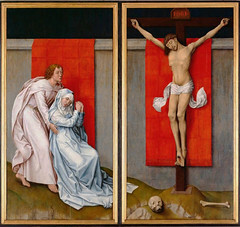 It also showcases the largesse of the donors (left), depicted kneeling on the lowest corners of the exterior, who employed the van Eyck brothers to immortalize them in this very public work of art. 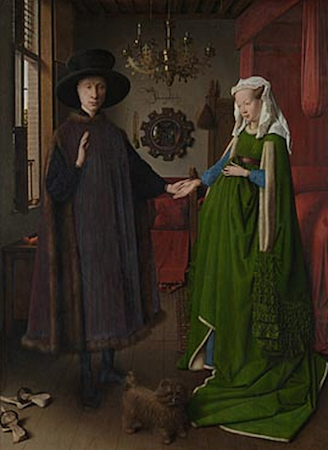 Jan van Eyck’s Arnolfini Double Portrait (1434) shows a well-to-do couple in a tasteful, bourgeois interior. 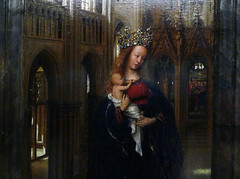 The text in the back of the image identifies the date and Jan van Eyck as the artist. 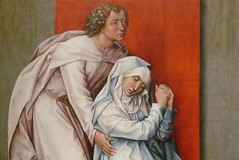 Art historians disagree about what is actually happening in the image, whether this is a betrothal or a marriage, or perhaps something else entirely. One of the most important aspects of this painting is the symbolic meanings of the objects, for instance that the dog may symbolize fidelity (“Fido”) or that the fruit on the windowsill may signify either wealth or temptation. This painting is a touchstone for the study of iconography, a method of interpreting works of art by deciphering symbolic meaning. Cite this page as: Dr. Bonnie Noble, "An introduction to the Northern Renaissance in the fifteenth century," in Smarthistory, August 9, 2015, accessed April 21, 2019, https://smarthistory.org/an-introduction-to-the-northern-renaissance-in-the-fifteenth-century/.